In a perfect world, we’d be at our peak productivity every time we walked into work. Unfortunately, that world doesn’t exist. If it did, there’s a good chance you wouldn’t be on your phone and your coworkers wouldn’t be stopping by to interrupt your work cadence. In our first post about productivity, we highlighted five tips that included learning how to say “no,” taking mini-breaks, avoiding over-scheduling, cutting back on emailing and cleaning up your desk. Each of these bits of advice is easy to implement. However, they aren’t the only ways to augment your creativity. The experts we reached out to were more than happy to share their wisdom with us, so much so that there was too much advice to fit into one article. So, in this post, we’re going to list an additional seven tips straight from the experts’ mouths. “Numerous studies have found that multitasking does not enhance productivity. In fact, multitasking reduces productivity. However, we often need to accomplish personal matters while we are ‘at work’ or during the workday. “Use the night before to play the upcoming day. If you’re in an office environment, take about 10-15 minutes before you leave to understand what your next day will look like. Understand what your most challenging tasks or goals are and prep for those. “At the beginning of each week, create a weekly check-in where you make a list of the tasks you want to complete during the week as well as the time you think it will take to complete each task. “Throughout the week, categorize and track your time not just by to the tasks your set for yourself at the beginning of the week, but also by the unforeseen tasks that arise on a day-to-day basis. 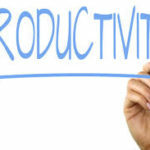 “A real downer on productivity is spending too much time on one certain task. Spending hour after hour on one thing can make your eyes blurry and your brain go radio silent, which doesn’t help that project get done any faster! “When we are interrupted by phone calls or emails during a time when we should be productive, we have to start all over again with getting focused back on our project. Productivity is a matter of discipline: Can you remove distractions and plan ahead? According to the experts we interviewed, it’s well worth the time to have a plan of action each week with the proper protocols in place to help you avoid social media and email distractions. One of the things that defines the way we handle our interactions with our clients is planning and protocol. We meet with you to find out what your office needs, then we apply our expertise and meticulous installation standards to provide you with a finished product that matches the dream office you had in mind.